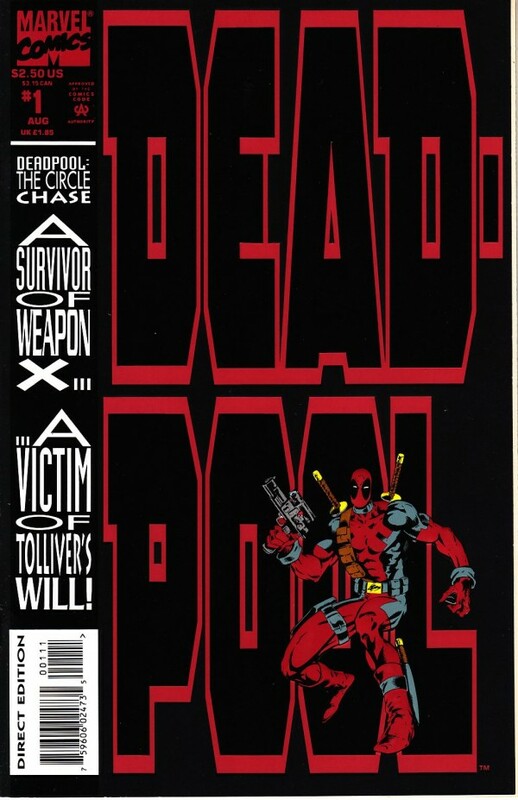 In April or early May of 1992 I was contacted by a Marvel Comics editor and asked to design a logo for their character Deadpool, who had first appeared in THE NEW MUTANTS #98 cover dated Feb. 1991. A mini-series featuring the character was being planned. I was doing lots of logo work then for DC, Marvel and other companies, and creating logos by hand, as I had not yet purchased my first Apple computer. My usual procedure was to draw three sketches on white typing paper, first in pencil, then inked with markers. The sketch above is one of those, and the only Deadpool sketch that I can find in my files. It looks like I thought the character’s name was two words, and I stacked them. Marvel liked this sketch, and only requested one change, the addition of a hyphen because the name was one word. You can see it penciled in. I next traced the sketch carefully in ink on Denril plastic vellum, my procedure at the time. This is a photocopy from my files of the finished logo that I would have Fedexed to the editor. That was the last I heard about Deadpool for a while. I wasn’t seeing many Marvel comics, as the company only sent me copies of ones where I lettered the stories, and I had no nearby comics shop. 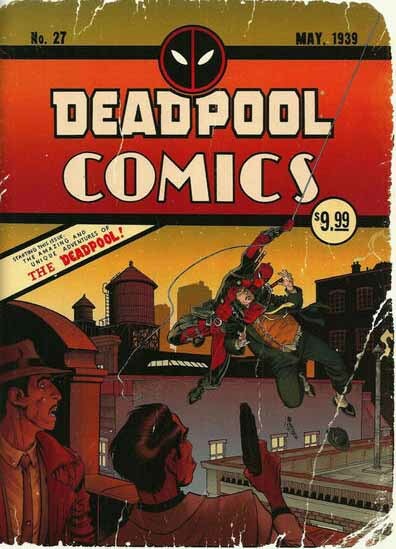 In the summer of 1993 the first Deadpool mini-series saw print. 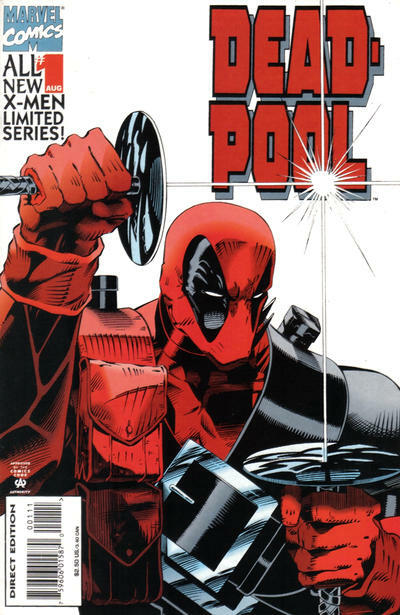 The cover of the first issue of DEADPOOL: THE CIRCLE CHASE is above. I’m not sure when I first saw it, probably not for a while. When I did, I was dismayed to see that my logo had been stretched vertically almost to the point of being unreadable, and it looked awful. In order to do this, someone had to trace my hand-drawn logo in Adobe Illustrator to create a vector file, which could then be stretched. The open drop shadow was not included, which is good. That would have made it even harder to read. A much better solution would have been to ask me to create a very tall version of the logo, but no one did. I would have made it look less distorted, at least. It’s possible that there was no time for that. A second mini-series in 1994 used my complete logo — still vertically stretched, but not as much. I don’t know that I ever saw it. In 1997 the character gained a regular series, and I did see issues of that occasionally. I must have been unhappy enough with the uses of my logo that I essentially forgot I had designed it, though. 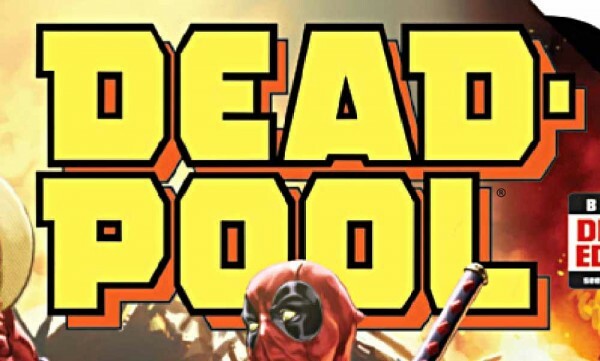 I have to admit that I’ve never to this day read any Deadpool stories. The character grew in popularity, developing a fan following for his unlikely combination of deadly violence and whacky humor (so I hear), and continues to star in his own regular series, mini-series and one-shots to the present day. Many variations of his original logo were developed. The telescoped version above was seen quite a bit. It uses the letter forms from my design as a starting point. There were also many clever parody covers like the one above mimicking DETECTIVE COMICS #27, the first appearance of Batman. Some of those also used my logo letter forms, some did not. Some covers have used my logo almost exactly as I created it. The most recent one I see in a quick search is this cover dated Nov. 2014. Here’s the official movie logo for the about-to-open film. When I saw it, I felt there was something familiar about the letter forms, but I had to look through my files to confirm I had designed them. That’s when I found the original sketch and logo seen above. There are minor differences: some odd angles in the A and L, and the treatment is very Hollywood, but clearly the movie logo is based on my original design, though the movie logo designer probably didn’t know it. Hey, even I wasn’t sure! In 2014 I wrote a blog post about a NEW TREND IN MARVEL MOVIE LOGOS, where they seem to be bucking the usual bland Hollywood designs and going to the comics for inspiration. In that article you can see their use of my Doctor Strange comics logo as part of the promotion for the upcoming film, though if it will actually become the official movie logo is unclear. 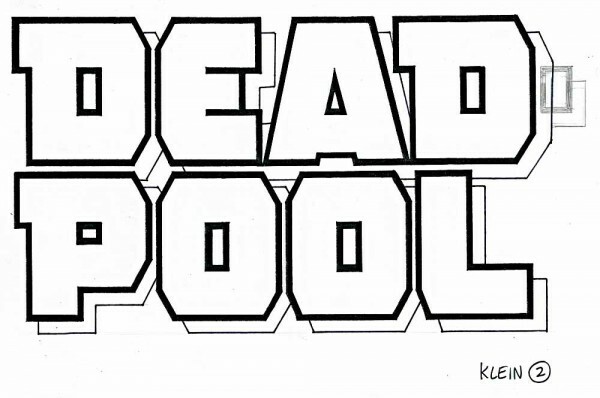 At least with Deadpool there’s no doubt that I have finally designed a movie logo — sort of! When I wrote about this on Facebook yesterday, some friends suggested I was due financial compensation, or at least a credit line in the film. That would be nice, but it’s very unlikely. The contracts for logo design in comics state that the company owns all rights in exchange for a generous one-time payment. I knew that then, and have no problem with it. As far as I know, logo designers have never been given any kind of royalties, incentives or profit sharing for other uses. In 1992 I was paid $500 for the logo design, at a time when my story page lettering rate was about $25 per page, so it seemed like a good deal to me, and still does. As for credit, no one at the comics companies keeps track of who designed their logos. Much of that information is only in the hands of the logo designers, or is lost forever. That’s partly what my Logo Studies are about, as well as my “Logo of the Day” feature on Facebook. You can find my logo studies on the LOGO LINKS page of my blog, if you’d like to read more. Meanwhile, I have to say I’m modestly pleased that my design, in essence, is on the movie logo, even if very few people will ever know it. Now, you’re one of them.